You can do it. Get out of your office. Image source. Busy increasing your ROI, optimizing your campaigns, boosting your conversion rates, writing killer copy, testing the latest headline and so much more. The list goes on and on because marketing never sleeps. But take my word: you have to get out of your office. No, I’m not talking about taking a vacation, although those are great too. I am talking about spending a couple of days at a conference – learning, connecting and gaining invaluable knowledge from industry leaders and attendees alike. Not just any conference. After all, conferences can be expensive. There’s the ticket, transportation cost, hotel, meals – and then add in your time, the most costly item of them all. All of this means that you have to justify the cost and choose wisely. Choosing the right conference will not only arm you with fresh ideas, tactics and techniques, but you’ll also leave feeling motivated and rejuvenated. At the end of the day, you want to attend a stand-out, top-notch conference that will give you the most bang for your marketing dollars. To help you decide, I’ve asked around the industry and rounded up some of the top upcoming marketing conferences in the next 4 months surrounding the topics of conversion, testing, copywriting, content marketing, inbound marketing, email marketing and more. What? SEO, inbound, social, community building, content marketing, brand development, conversion, mobile, analytics and more. MozCon‘s tagline reads, “Not Your Typical Marketing Conference,” and that couldn’t be more apt. Attendees have described it as a marketing rock concert, a conference with personality and a great place to sharpen your saw. And that’s why 1,300 people flock to Seattle each year to attend. The one-track schedule features an impressive roster of speakers who deliver 45-minute presentations packed with next-level strategy. With tangible deliverables from each presentation, you’ll walk away fully equipped to implement what you learned. Throw a bunch of online marketers into a room and they’re bound to get acquainted, right? What’s better is that Moz starts the networking process before you even arrive at the conference center with their Twitter list and Facebook group. What about the actual face-to-face networking? Moz has that covered too. For this year’s MozCrawl, Moz has partnered with several awesome companies, with each one stationed at a bar. Did I mention that Unbounce will be there? We have some awesome surprises in store for you, so be sure to swing by and say hi. Oh and here’s the full run down of what we’re up to at MozCon! If you know Moz, you know that they live and breathe by TAGFEE, their code of values that flows into everything they touch. The conference is a great physical representation of TAGFEE – it’s transparent, authentic, generous, fun, empathetic… but mostly, it’s exceptional. Content Marketing World is described by past attendees as “an action-packed show” and “a prestigious experience.” In fact, the organizers report that over 99% of Content Marketing World attendees said they would attend again. Now that is an impressive stat. Every year, Joe Pulizzi and the folks at Content Marketing Institute gather thought leaders in the content marketing space. Last year, over 1,700 marketers from 46 countries attended. This year, the conference will bring together over 2,500+ attendees and 100+ speakers to provide actionable insights and to speak about the future of content marketing. So what makes Content Marketing World a global event worthy of its name? Well for starters, it has great content at the event. But there’s also a wealth of content surrounding the event that has been created by attendees, speakers and organizers alike: blog posts, webinars, Twitter chats – you name it. Judging by all the hype, this event is not to be missed. Content Marketing World knows how to do networking right. In the past, attendees gathered at the Rock & Roll Hall of Fame in downtown Cleveland. This year, they’re putting on “ContentFest”: their own music festival featuring local bands and a dozen food trucks. Shameless plug: We had to throw our own conference into the ring, but only because we feel it really, truly belongs up there. We might not have the track record of other conferences (this is our first year hosting it after all) but we’ve rallied some of the best speakers in the industry and are closely curating all the content. 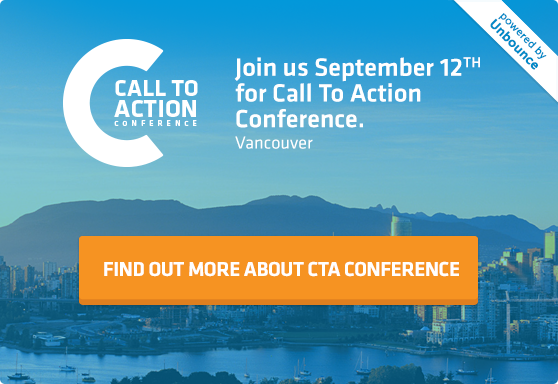 Unlike a lot of conferences on this list, Call to Action Conference will be small and intimate with a max attendance of 330. 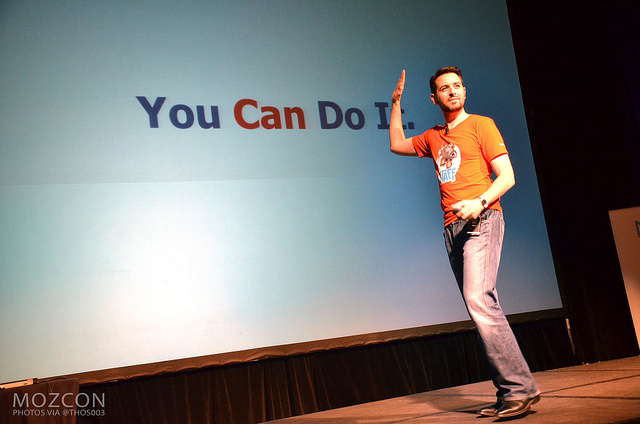 This means you’ll get more time to network with speakers and other conference attendees (and the Unbounce team too!). Some people prefer smaller conferences for exactly this reason: they provide intimate networking opportunities. The content for the event is focused on five pillars: All talks will be actionable, audience-focused, advanced, unique and entertaining. Like MozCon, we want attendees to walk away with actionable takeaways so they can easily implement what they learn. And because we’re 100% audience-focused, you – the attendee – are our number one priority. We won’t have any sponsors or sponsored content. Additionally, we expect our audience to be more advanced than your average Joe (you guys are smart), so our speakers will dig deep and pull out some advanced and next-level advice. Lastly, the content we deliver will truly be unique and of course – in true Unbounce style – entertaining. The one-track conference technically only spans a day, but because we know how important face time is with other attendees and speakers, we’ve surrounded this one-day schedule with a bunch of non-stuffy networking opportunities. The evening before the conference, you’ll be invited to our brand new head office for casual, local brews. And on the day of the conference we will of course be having an off-the-charts after-party. And finally, the following day, we’re inviting attendees out for a variety of extra-circular Vancouver activities to see the city and get to know each other (and us!) in a more casual environment. Inbound is massive. It’s the world’s largest inbound marketing conference, featuring over 150 sessions given by more than 140 experts over the span of four days. With different tracks and a ton of partner booths, the conference is centered on big picture thinking, inspiration and change. Keynote speakers are big names from marketing and business alike: Martha Stewart, Simon Sinek and Guy Kawasaki to name a few. They are the type of people who challenge the status quo, push you to think big and make radical changes to your marketing strategy and your business. The networking events are like no other. After each day, HubSpot hosts events ranging from happy hours to so-called Boylston Street Parties and even an “Inbound Rocks” concert. In past years, they have hosted the Grammy-nominated band OneRepublic and two-time Grammy winner Cyndi Lauper. If you’re looking for celebrity sightings and inspiration at a large-scale event, this is your conference. SiteTuners’ CEO Tim Ash is a recognized authority in the field of conversion rate optimization and wrote the book on landing page optimization. So it’s not surprising that the conference hosts best in class speakers and attracts the world’s top brands. Bonus: our own Oli Gardner will be speaking in both London and Berlin. Which brings me to my next point: Conversion Conference hosts events in various cities across North America, Europe and even the land down under, Australia. Conversion conferences aside, Berlin and London are arguably two of the best cities in Europe. What a great excuse to visit. What? Email marketing, content creation, social media, SEO, conversion optimization and buyer psychology. This is AWeber’s first-ever conference and the event promises to be awesome and educational. Did I mention our own co-founder, Oli Gardner is speaking too? 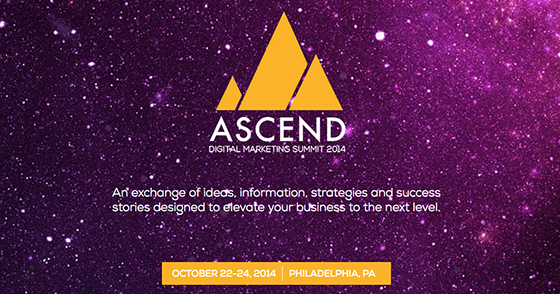 ASCEND Summit promises to be an exchange of ideas, information, strategies and success stories designed to elevate your business to the next level. ASCEND Summit aims to prepare you for the trek ahead. If you’ve been to Hero Conf or read the PPC Hero Blog, then you’ve encountered the friendly, intelligent people at Hanapin Marketing. PPC can make some people yawn, but not with this crowd. These folks know how to put on a high-value event. Our team went to PPC Hero Conf this past April in Austin and I can say first-hand that I walked away with a ton of knowledge and connections. Our co-founder Oli Gardner even snagged the award for best presentation. With Hanapin’s flagship Hero Conf event growing, they are breaking out and offering smaller, more focused events. This one zeroes in on conversion. With two powerful keynotes and 10 breakout sessions, Hero Conf Conversion Summit lives up to the Hero Conf reputation for deep, actionable education. They have two tracks: “Science” and “Magic.” The former will explore structural and analytical CRO components while the latter will examine the more creative components of conversion rate optimization: color, copy and how to think of “out-of-the-box” testing and optimization ideas. On top of that, if you’re interested, they will be hosting one-on-one workshops. Hanapin’s conference boasts “non-stop networking.” From the time you touch down, when you’re not in a session, you’ll be invited to one networking event after another. So there you have it – seven stand-out marketing conferences coming up this fall that you don’t want to miss. Choose a conference worth attending this year and get out of the daily grind. Go to one of these conferences and you’ll meet people that could have a significant impact on your business. More importantly, you’ll come back with tons of new connections and takeaways you can apply to your marketing efforts. Know of any other notable conferences to add to the list? Let me know in the comments!